Contemporary Diamond and Emerald Dress Ring. 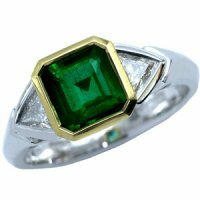 An Emerald Cut Emerald and diamond 3 stone ring. A passionate, intoxicating emerald and diamond ring composed of an octagon shaped emerald, weighing 1.45 carats, set in an 18 carat, yellow gold, rub over setting. Two trilliant cut diamonds, weighing 0.42cts in total are set either side, in an 18 carat, white gold, rub over setting, to a white gold chamfered style shank. 18k - 750.